Snap-In Absorbency with GroVia! Choose from No-Prep, Stay-Dry or Organic! GroVia Snap-In Soaker Refills easily snap into the GroVia One-Size Diaper outer shell. Trim, yet absorbent, your GroVia Snap-In Soakers reduce your diaper wash, consuming less water and detergent. True leg gussets securely contain baby's messes within the soaker. This shell, sealed with a durable, hard-working, waterproof, TPU (Thermoplastic Polyurethanes) laminate, serves as a diaper cover for the absorbent soaker. One soaker snaps into the shell at a time. Layer the GroVia Snap-In Soaker with a Booster for extra or overnight absorbency. GroVia Snap-In Soaker Refills - Certified Organic Cotton! 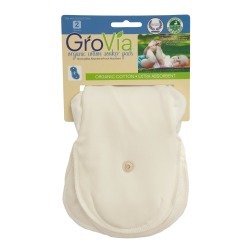 These TPU backed, 6-layer elasticized snap-in soakers are an unbleached (dioxin free), natural color; sewn from certified organic cotton fabric they are designed specifically for the GroVia One Size Diaper System. GroVia Snap-In Soakers, coupled with the GroVia Booster make up the absorbent portion of the GroVia One-Size Diaper System. GroVia Snap - In Soaker Refills - Stay Dry! Stay Dry Soaker Pads are designed to be extra absorbent and quick drying for total comfort against your babys skin. Made with a TPU outer, four layers of hemp/cotton blend topped with cozy micro fleece, and ultra soft leg gussets. 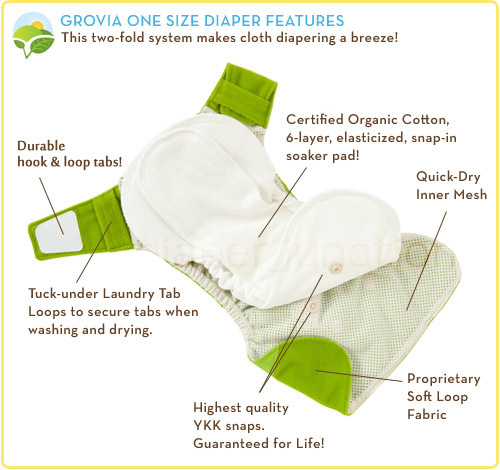 The GroVia One Size Diaper System is two-fold; outer diaper "shell" and inner, snap-in, certified organic cotton soaker pad. Because the outer shell can be re-used over and over, you will need additional Snap-In soakers to match your baby's wetting needs. Sold in Packages of two (2), the GroVia Snap-In Soaker Refills serve as the cloth diaper in the Washable & Water-Resistant - One Size Diaper System. 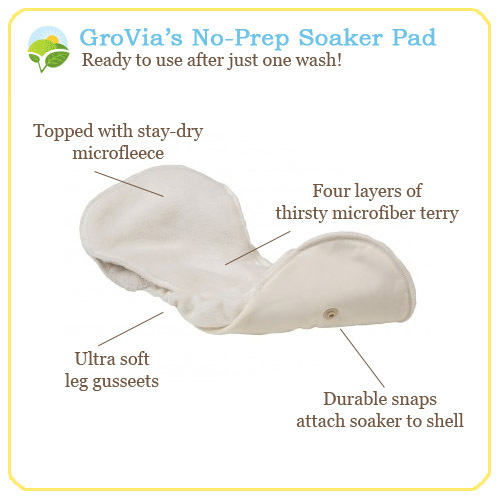 Now Available - GroVia's NEW No-Prep Soaker Pads! Same great snap-in design featuring gentle gussets and microfleece top. Four super thirty layers of microfiber terry. No prepping required! Wash once and they're ready for use. We love this system from GroVia, and we particularly love these inserts! They are soft and absorbent. Never have leaks AND cleaning solids off is way easier with the no-prep than the organic cotton! We purchased a number of these No-Preps before our baby arrives to use with GroVia shells and other covers. The biggest reason I don't have more is the cost. Other inserts or prefolds are a better value but these are easy for childcare providers or extended family to use. 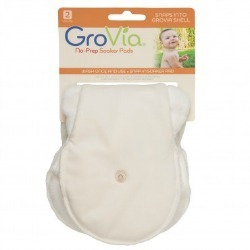 My fav Grovia inserts, they are the most absorbent and easy to clean. These are pricey, but are unlike any other AI2 inserts I've seen. The internal gussets are nice and create a great fit. Being wider at the back than in the front also helps get a great fit. The Microfiber is partially exposed and makes me worry it'll touch my daughter's skin, but the cotton are great. Such soft material, i love the ease of these diapers!